Traditionally, the development of tires involves a lot of road testing. This however makes the process long and complex, involves a lot of trial and error and is very expensive. With VMI’s indoor compound testing, this road testing can be reduced to a minimum and you will obtain the results much easier and quicker and against predictable costs. VMI’s testing equipment furthermore allows for the testing of far more compounds in order to optimize the final tread compound, even for extremes of temperature. By accurately simulating road conditions you can save time and money by evaluating tire properties before production starts. The VMI solution allows you to quickly and economically perform laboratory testing of rubber samples. 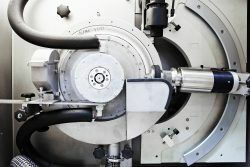 It can be used for routine measurements, but also for scientific research, measuring both the abrasion resistance and the friction properties under a wide range of selectable conditions. Depending on the main purpose of use, the system can be adapted and extended according to your requirements. Highly accurate simulations of road conditions for fast and economical laboratory testing of rubber samples.